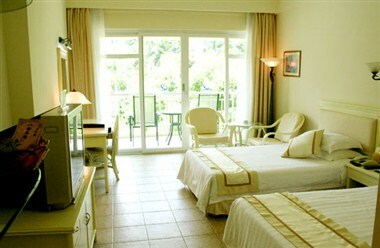 Sanya Landscape Beach Hotel, located in Dadonghai Tourist Attraction and affiliated to Hubei Hongxin Asset Management Co., Ltd, is an international four star tropical beach resort. 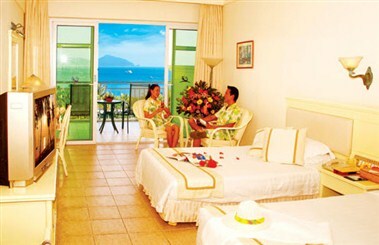 Its face toward the sea and back to the mountains, only 38 seconds walk to the beach. All the buildings of the hotel vary in height and are built in graceful disorder and with unique design, and are compatible with the green mountains, blue sea and blue sky, forming one integrated mass. By owning an open lobby, the hotel is so near to the blue sea which can be reached very easily; 208 guestrooms are designed with comfort and different style, with sea view or mountain view, and all rooms are equipped with ADSL Internet Connection, independent balcony and super large French window. The graceful Chinese restaurant features Cantonese food, Hubei food, Hainan specialties, Hong Kong style morning tea and seafood; Golden pool western restaurant serves all sorts of Mediterranean western- style cakes, breakfast buffets and Brazil BBQ. You can enjoy the sea view when having delicious food. 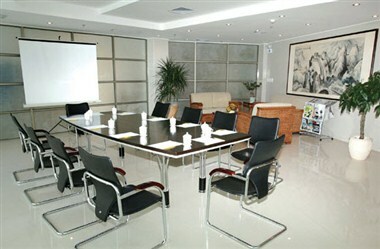 The hotel has four conference rooms with different sizes, which are Sea Charm Conference Room, Sea Bay Conference Room, and Landscape Conference Room. 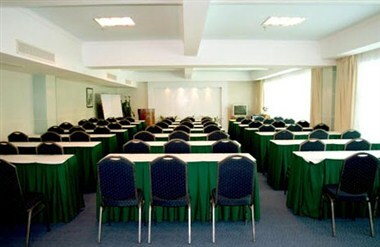 All the conference rooms accommodate from 20 to 320 people separately, and all are equipped with modern and advanced communication and audio equipments, all sorts of important meetings, business negotiations, banquets, and cocktail parties can be held in these halls. 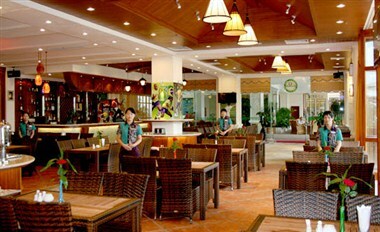 Sanya Landscape Beach Hotel will be your best choice for having a holiday or holding a meeting in Sanya. It is with graceful Landscape and elegant environment. When being in the hotel, you can see the green mountains, overlook the blue sea, listen to the sound of waves, watch the scene of thousands of people playing in the sea, making your holiday in Sanya full of warmth, romance and comfort and you will forget to return.